Derwent is proud to announce the launch of the Derwent Lightfast range. After being announced in January at CreativeWorld, artists and retailers were abuzz with excitement about our latest range. 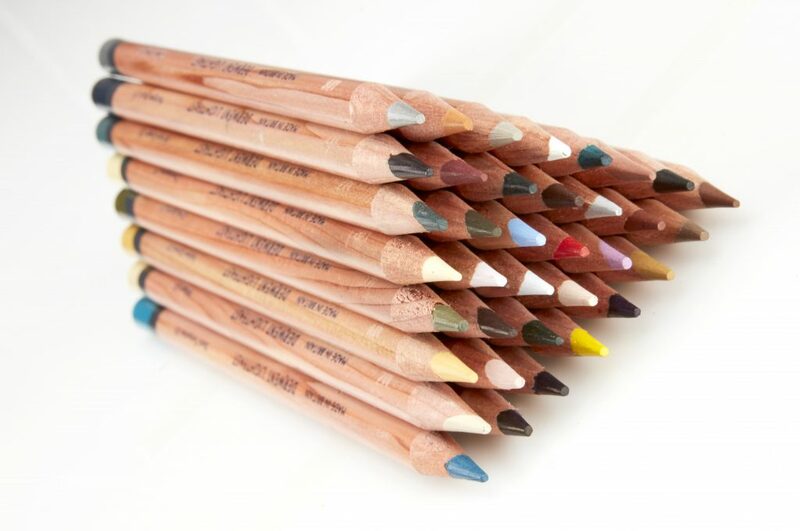 Boasting 100% lightfastness, the oil-based pencils have a smooth and creamy finish with a beautiful laydown of rich colour. 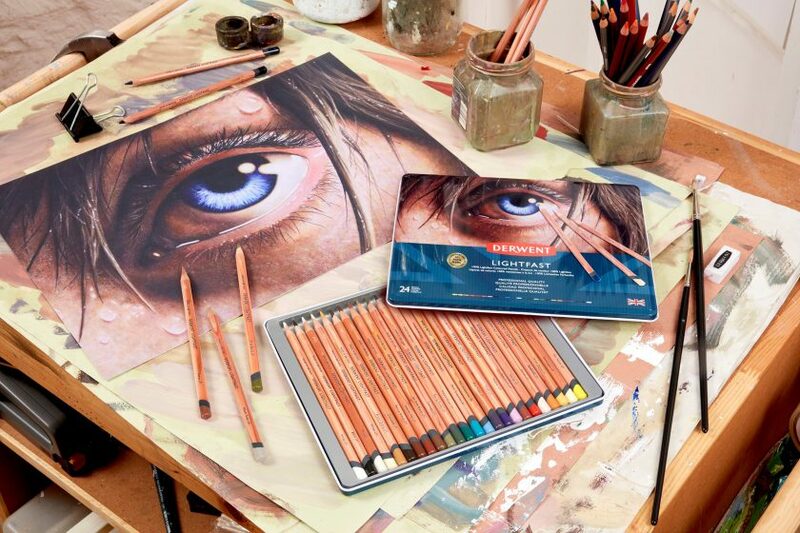 To celebrate, Cindy Wider has interviewed Jesse Lane, award-winning coloured pencil artist who was commissioned to create the inspiring eye image that adorns our latest range. Find out how Jesse started out as an artist, his passion for coloured pencils and the Derwent Lightfast range in the latest Derwent Blog! Jesse, could you tell us when you first realized that you enjoyed creating art as a child and were you supported in your decision, if so by whom? I think I always enjoyed creating art, but I wasn’t very good at it. When I was 14, my art teacher told me I was the worst in the class. The following year, I made friends with the art kids at school and that was when I really got into coloured pencils. I started with little self-confidence. As my dad was a former graphic artist, I gradually improved when I got him to critique my work, whereas previously I never always let him. What journey have you been on as an artist. For example when did you first begin to create art as an adult? Did you study at all and if so where? How was that experience? During the first few years I practised rendering ability. Then I tried to create a style for my work using lighting and colour. I studied animation at Texas A&M University, but quickly decided that wasn’t what I wanted as a career. I began taking more drawing classes and trying to turn animation assignments into drawing ones. At the time it was frustrating, but it got me thinking for myself instead of sticking to class assignments. Many artists can render well, but don’t know how to think originally. You were commissioned to create the artwork on Derwent Lightfast tins. What makes Derwent Lightfast Pencils a tool you enjoy using? As a coloured pencil artist, I applaud Derwent for making an entire range of 100% lightfast coloured pencils. Lightfastness has traditionally been a concern for both artists and art collectors alike. It’s testament to them that they’ve listened to and understood the needs of creatives. 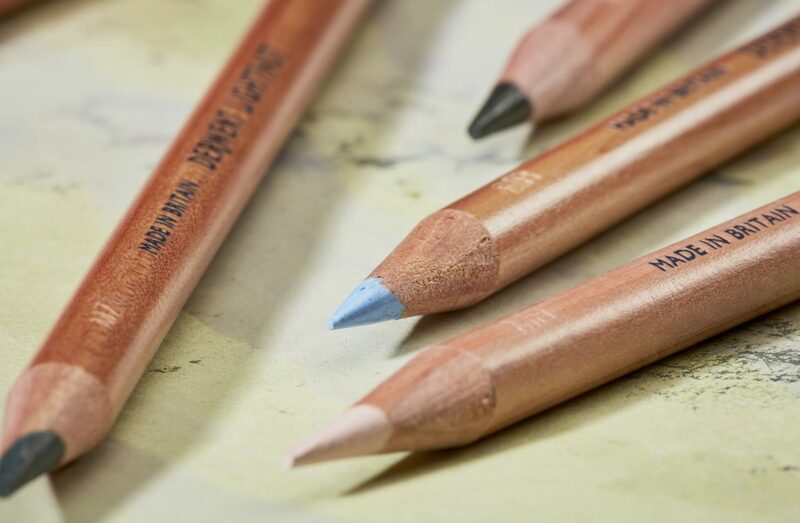 The Lightfast range is the brand’s first fully oil-based pencils. A good balance is struck between soft and hard meaning that I can create a fine point without worrying about the pencil snapping but still maintaining the smoothness of a creamy, soft pencil. The pencils themselves have a classy appearance with a varnished, bare wood. The neutral tone allows the coloured ends to stand out, making it easier to quickly locate colours while working – a bit help especially when you’re working on a piece of art at the size I am! How do you manage to create such detailed texture with a coloured pencil? People are most interested in my technique for drawing skin-tones. I work from general to specific. This is quicker and much simpler than trying to draw details from the start. I begin by applying large blocks of colour. I work in shades of tans, beige, creams and browns. This establishes the values of my subject. Next I begin to work in colour — adding pink, purple and yellow, or a brown that has a hint of red in it. These patches of colour are often smaller but create a basic texture..
Lastly, I capture the tiny details. Even if skin lacks wrinkles, it’s always splotchy. I add tiny splotches of colour to create an organic appearance. With these splotches, my colours get more saturated. I find the previous layers help mute the intensity of the later colours and keep the skin unified, while providing variety. For artists just starting out on their creative journey, what are your top tips? Be intentional with your time and have a schedule. You can’t always expect others to fit into your schedule, but it helps if you establish one for yourself. Treat every piece like it’s your next best piece. You grow most when you challenge yourself, like in the gym. While you do want every piece to be your next best, it doesn’t mean it will be. But there’s a positive correlation. We all have that one piece that we don’t like very much, but everyone else seems to enjoy. So make the best of every piece, because while you may not value it, others might and it could greatly help you. The more you can plan ahead, the more time you’ll save and the better your work will be. Is there anything else that you would like to tell me about your art journey so far and your inspiration to create art, that I could include in your interview to inspire others? It’s not a story of triumph, but more of an empowering realization when something terrible happened in my art career. In December of 2016, I had my first solo show, Face Reality, at RJD Gallery. The morning after the exhibit closed, the gallery was destroyed by a fire. I was devastated. I lost five major pieces that together, took over 1,000 hours to create. I had to start over. I literally had to Face Reality. I felt small and the challenges seemed overwhelming. But as much as the fire upset me, every day I still had the option to go into my studio and create new work. I think it was important for me to acknowledge the loss and draw inspiration. Sometimes triumph isn’t having some sort of amazing comeback, but pushing through unfortunate situations and getting through to the other side. Sometimes stubbornly persisting is the most important thing someone can do. Derwent would like to thank Cindy Wider for her collaboration on this interview.